What Dealers Say about FORZA ERP | Industry Analysts, Inc.
All Covered, A Master Value Added Reseller (MVAR) and OEM Partner for SAP Business One delivers FORZA! 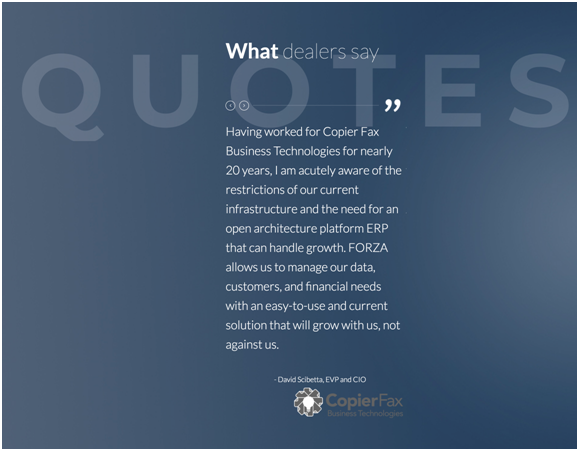 FORZA, built on SAP Business One, offers the copier dealer and print imaging industry an option to their current infrastructure and business system and provides them with an ERP that enables growth inside and outside of the channel. The infrastructure of FORZA was specifically designed with open-architecture. Dealers have the capability to customize functions that knock down barriers and take away limitations for future opportunities. Its intention is to allow company growth while maintaining the central core of your business all at once. This entry was posted in MWA and tagged all covered, forza, MWA by IA Staff. Bookmark the permalink. ← Previous Previous post: Muratec’s Small Workgroup Models – Check Them Out!